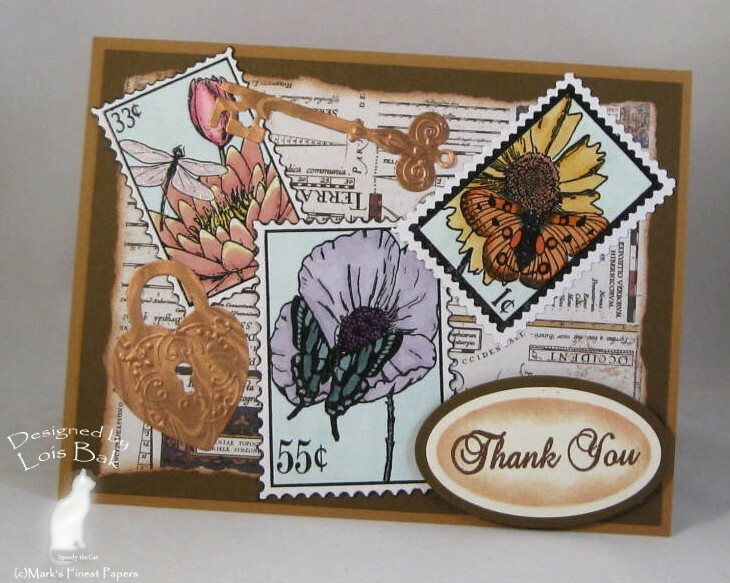 Vicki Dutcher wanted the Stampin'Bs to celebrate this week! I'm a little under the weather, but I didn't want to miss a chance to celebrate the new year. This was a quick and simple card -- took me about 15 minutes, start to finish. I'm not sure I could have concentrated for much longer than that! I love stamping the fireworks in variegated colors -- they look so festive that way. I matted the panel in several of the same colors. 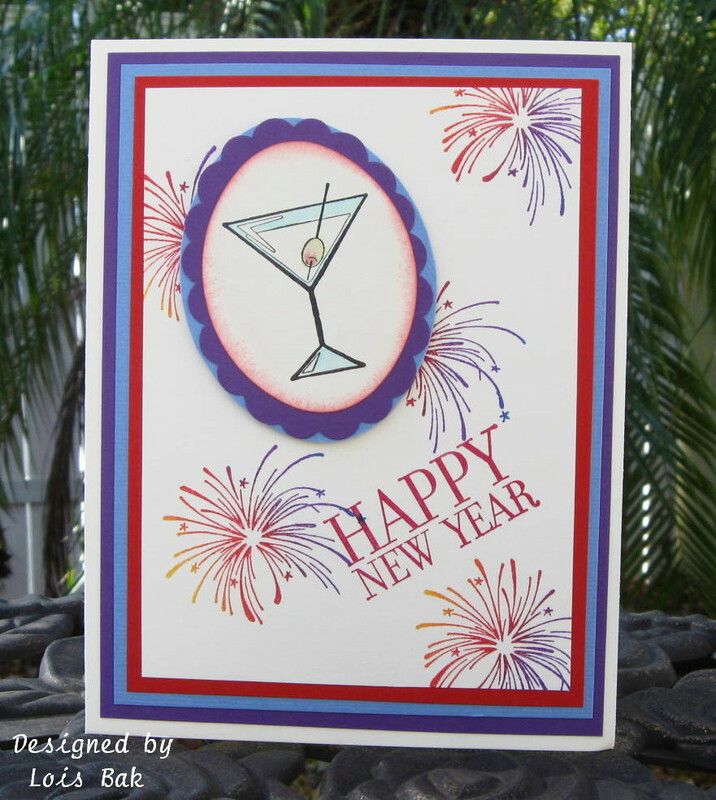 I found the martini stamp in the $1 bin at Michaels a few years ago, and I dressed it up in some scallops. The sentiment is from SU's Holidays & Wishes. My daughter gave me these appropriate salt & pepper shakers -- different drink, but close enough. 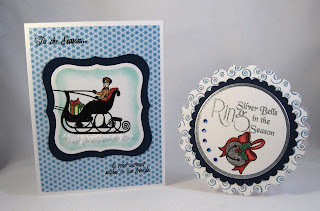 I was the hostess for the Stampin'B's DT Blog challenge this week, and I asked everyone to use ribbon for something other than a bow or knot. That said, I'm not even sure I like my card -- but it's done; and it is what it is. It looked much better in my mind! I sewed some running stitches through a piece of ribbon and then drew it up into ruffles, which I then attached to the back of my stamped/embossed heart. I stamped the same heart image three times in pink onto a piece of white cardstock and then punched a border on either side with a MS lacey border punch. I found a piece of DP in my stash that had the same shades of pink as the Strawberry Freeze layer and the pink ink of the three background hearts. 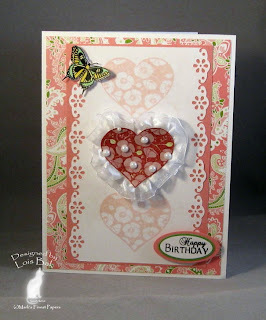 I positioned the red, ruffled heart over the middle one with pop dots, then added the butterfly and sentiment. The Inspiration Challenge on SCS is my favorite of the week. 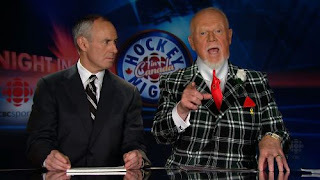 And this week's site for the inspiration was a hilarious look at some really outrageous sport coats worn by commentator Don Cherry. I was compelled to make two cards using his jackets for my inspiration. 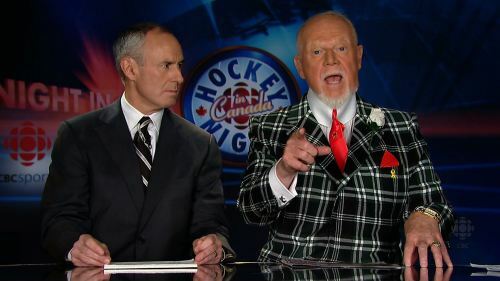 I love plaids, and so both of the jackets I chose had to be plaid. the first one is a black and white. 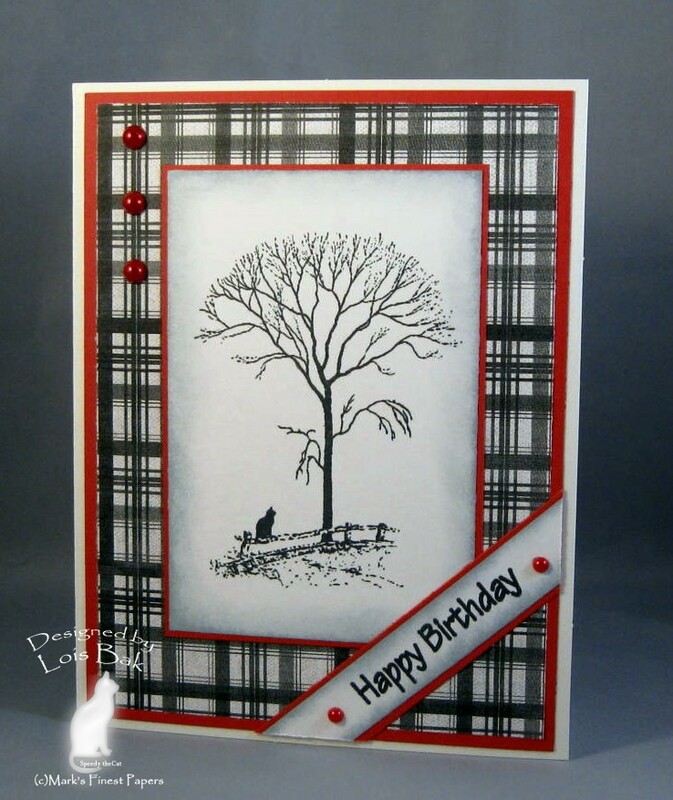 I must confess that the plaid DP I used for this card started out red and green. I copied it on my printer, using no color -- thus it came out black and white. I make lots of birthday cards for the residents of the assisted living facility where my mom lives, and cards for men are always a challenge. I think this one will work. The tree image and sentiment are from Mark's Finest Papers' Our Family Tree. I picked up the touch of red from Don's tie and handkerchief by matting the panels with MFP Ripened Tomato -- and added some red half-pearls. My second card was inspired by this blue and lime green plaid jacket. I had one last gift card holder to make for Christmas, and today's Inspiration Challenge gave me that opportunity. 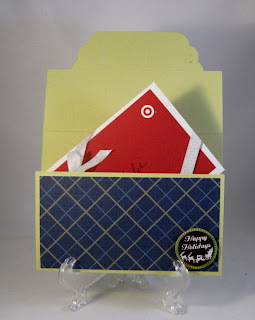 I had a small piece of this lime green and blue plaid DP -- enough for the background of my gift card holder, which is for my granddaughter. I had also bought her another gift, which I had wrapped with snowman paper. So this cute little snowman from MFP Snowman Country seemed to be an appropriate accompaniement. I had been fortunate enough to win these Labels Eleven dies during the SCS Hope You Can Cling To month-long challenge in October. 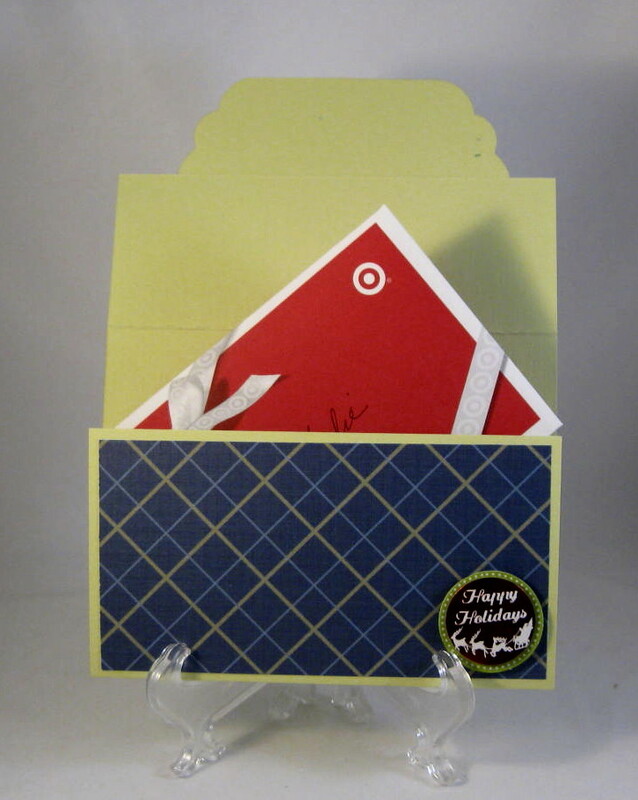 Here is the gift card holder open. Thanks for stopping by and looking at my creations. 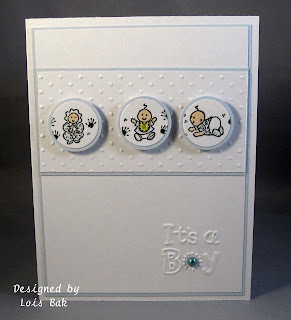 Brenda was the hostess for this week's Stampin'Bs challenge -- to make a baby or toddler card. Let me first say that I have very few baby stamps. 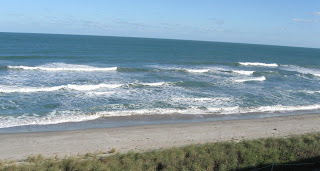 Secondly, I had a very hectic week and at 8:00 Faith called me looking for my card -- which at the time was non-existent! So . . . I scrambled and put this together in about twenty minutes. Whew! One of the few baby stamps I have is this PSX stamp my daughter found at a garage sale. All three images are on the same stamp. After coloring the three babies, I punched them out with a 7/8" circle punch and matted the circles with 1" circles then popped them up on pop dots. 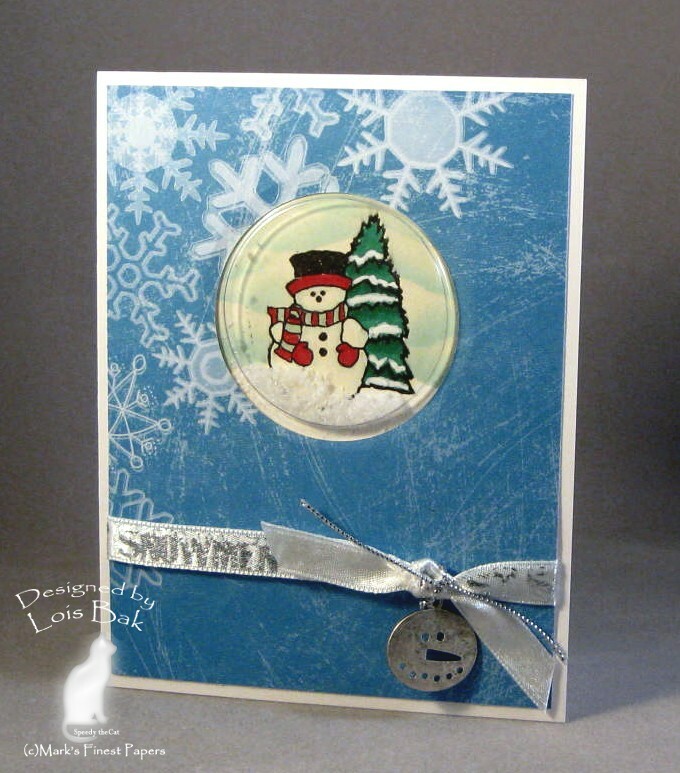 I ran the top white panel through my Cuttlebug using one of the small embossing folders and then glued on the blue half-pearl. The temperatures in Florida over the past several days -- and again what they will be early next week have not had the feeling of the South! 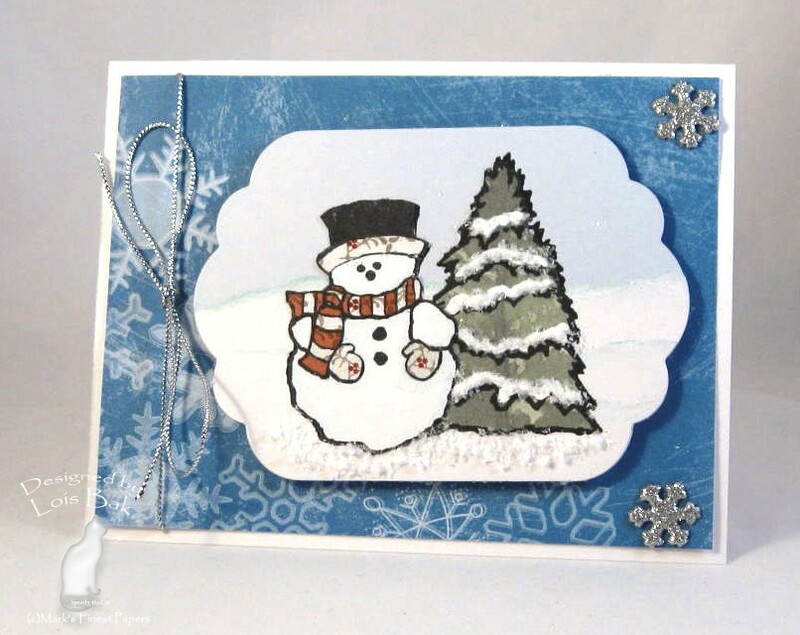 I've made a few cards using this cute little snowman set from Mark's Finest Papers called Snowman Country. 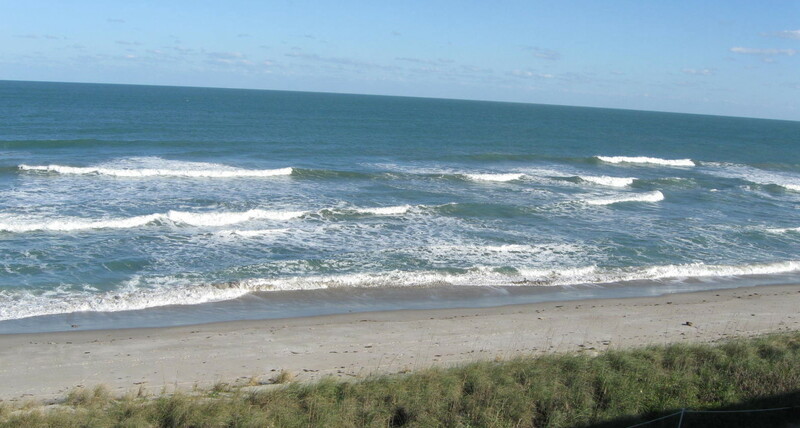 Now, Florida is not snowman country, but it's definitely been cold. 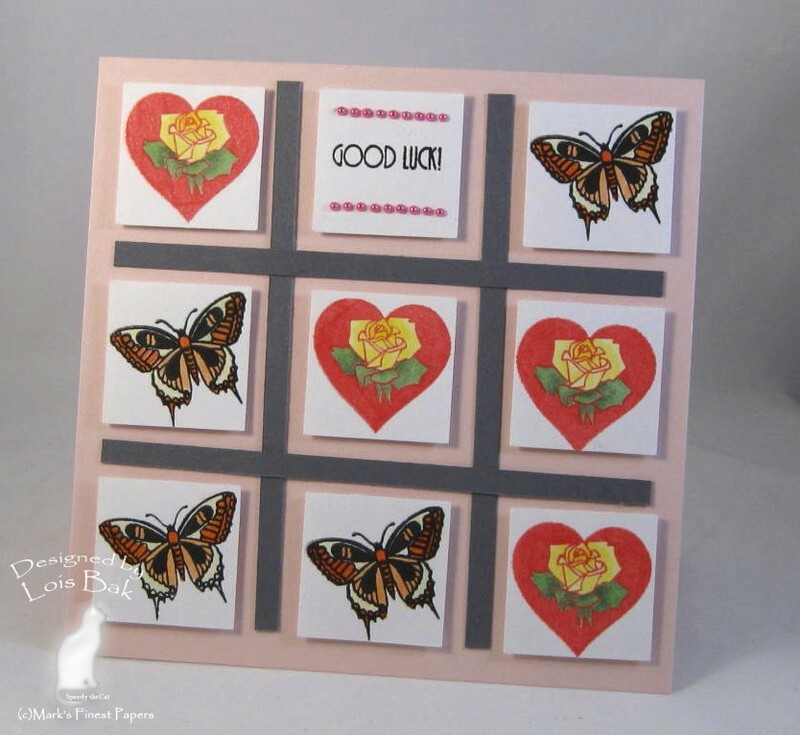 My first card was made for Speedy's Friends challenge to use paper piecing, which is a fun technique. I cut a Labels Eleven shape several times -- once in blue and twice in white, ripping the white so that the layers would form snow drifts. I sponged on some Palette Ballet Blue to emphasize the layers of snow. 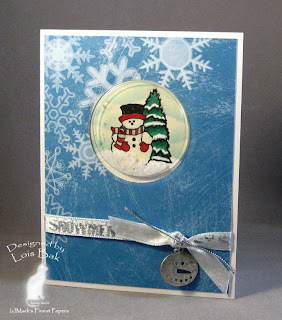 Then I stamped the tree and snowman over the layers. After stamping them again I pieced them over top of the original images. 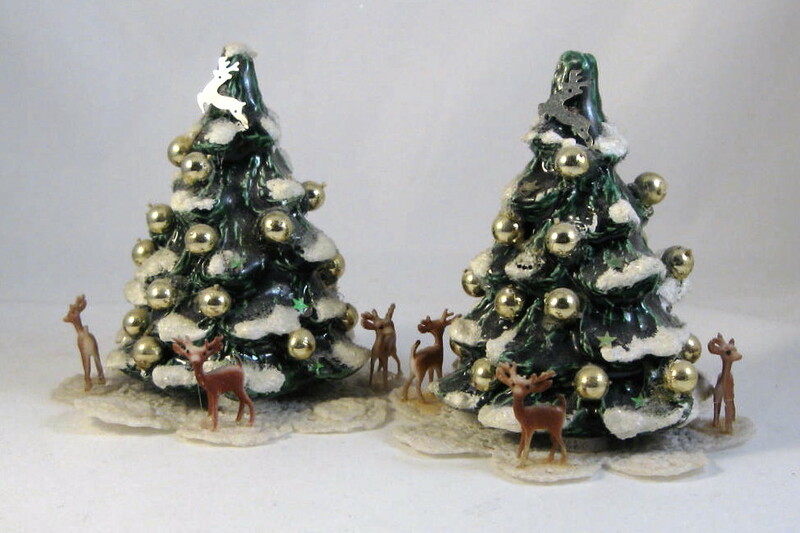 The tree was actually stamped on some fern DP I had in my stash, but the ferns were the right shape for the tree. I stamped the snowman again on a piece of Basic Grey Wassail DP and cut out the hat brim, scarf and gloves -- then pieced them over the white snowman. I added some Polar White Flower Soft for the snow. Because the white Flower Soft works much better over white, I painted a little Copic Opaque white paint on the tree branches. The background DP on the card is from this year's DCWV Winter matstack. 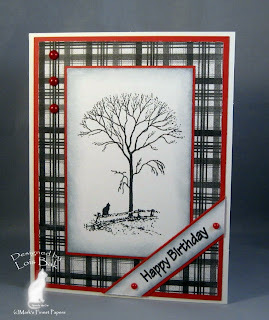 Using the same papers and stamps, I made a card for this morning's Inspiration Challenge, the site for which was Shabby Apple. When I was at StampFest last year, I found these wonderful little shaker card pouches -- no more foam tape! I used one of the round ones to make my card today, which was inspired by the color of this dress. I'm still making Christmas cards, so this one fits right in! 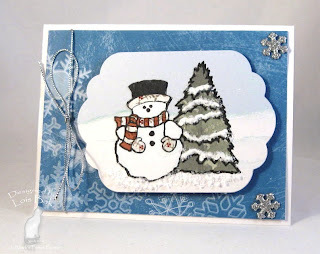 When I stamped the snowman, I inadvertently used ivory cardstock instead of white, so I used some Copic White Opaque paint to add the snow on the ground and on the tree. I added some Flower Soft to "shake" around the snowglobe. 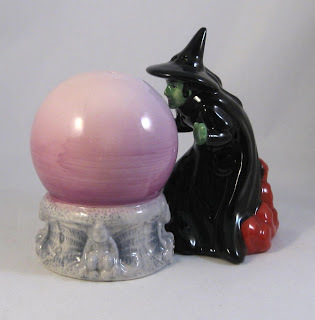 I thought I would show you these wonderful salt and pepper shakers, which my best friend made about ten years ago, when she was making ceramics. She has since started rubber stamping, and I think the ceramics hobby has gone away. 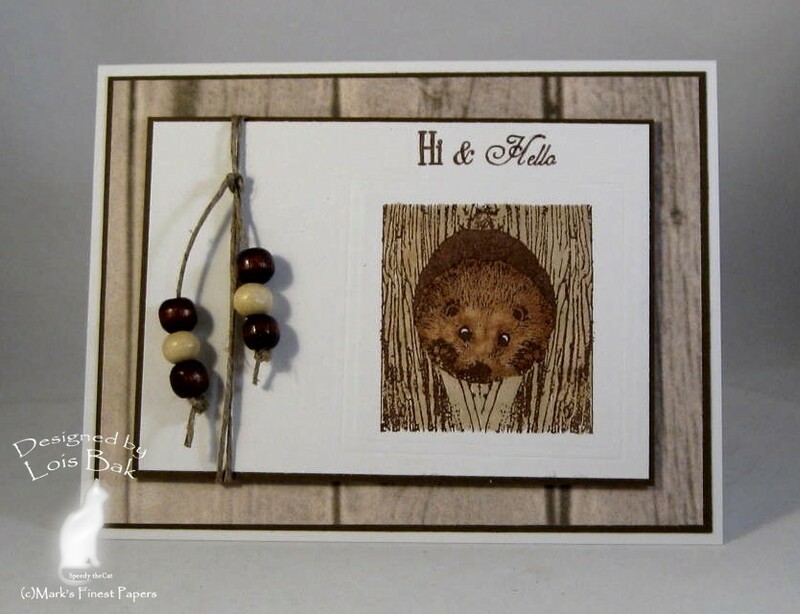 Welcome to the MFP November Blog Hop! While I’m not officially part of the Blog Candy hop today, thanks for stopping by and looking at my projects. We have 4 New Stamp Sets Released: Hearts, Hearts, Hearts; Nature’s Postage; Hello, Sunshine; and Take a Peek. For your convenience, all 4 stamp sets are available for purchase TODAY! For your chance to win BLOG CANDY, (a set that will be released NEXT month), visit and comment on each of the design team members' blogs TODAY. On Saturday, (December 11, 2010), a winner will be chosen from those participants who visited all the blogs listed for today. 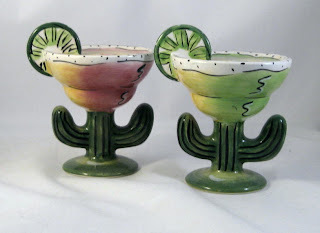 (There will be four different winners, one winner for each day of the blog hop. 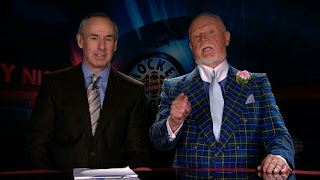 You DO NOT have to comment every day. However, the more days you comment, the more chances you have to win!) If you miss a day, you can go back and comment on each day's blogs, as the winners will be chosen Saturday morning! 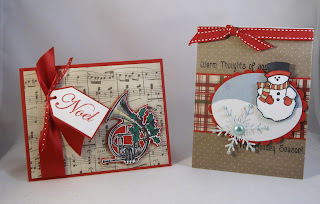 We end the Blog Hop with Take a Peek. I don’t do CAS cards well, so this is my lame attempt. 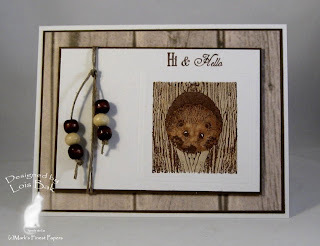 I stamped the hedgehog image onto white cardstock and then embossed the square around it. I had some digital wood DP that I thought would make a nice background. I added some twine and wooden beads. I'll probably have to hand-deliver this card because I don't think those beads will mail well! 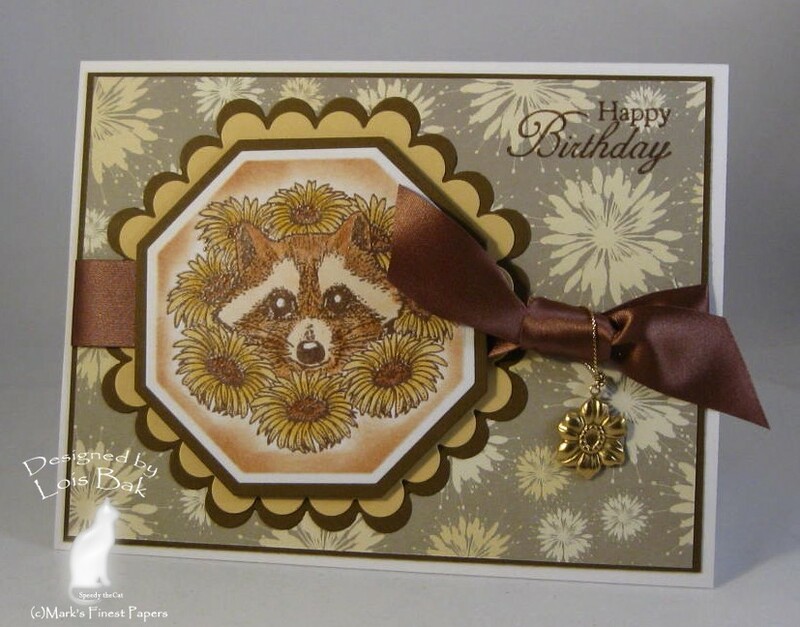 This cute little raccoon peeking out from the bouquet of flowers is stamped with Versafine Vintage Sepia and colored with Copic markers. I ran the ribbon between the plain and scalloped octagonal shapes and added a little charm. 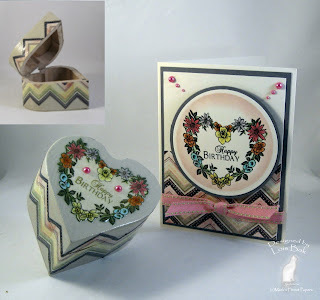 I’m always in need of birthday cards, so that’s the sentiment I used from this set, which has a total of NINE sentiments. 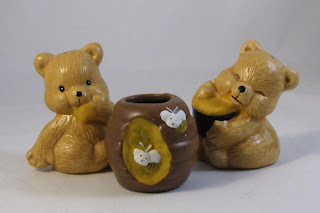 My son gave me these cute little honey bears quite a while ago. 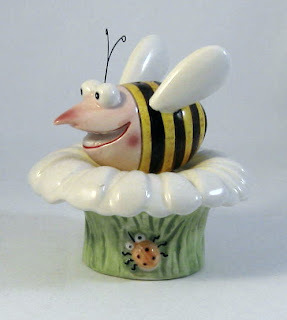 I'm not sure what the honey pot would hold -- toothpicks, maybe. Be sure to visit the rest of the team to see what they did with this set and comment on each of the participating members’ blogs. You have one more chance to win one of the stamp sets to be released next month. Welcome to the MFP December Blog Hop! 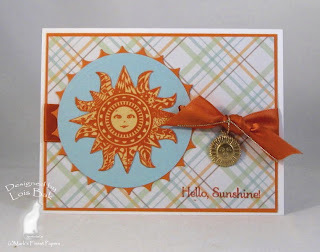 My first project is serving two purposes – the Stampin’B’s challenge for this week and also Day 3 of the Blog Hop. 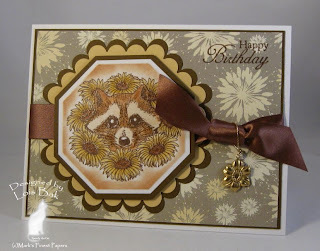 The hostess for this week’s Stampin’B’s challenge was NancyRuth, who wanted us to put a star or stars on our card. 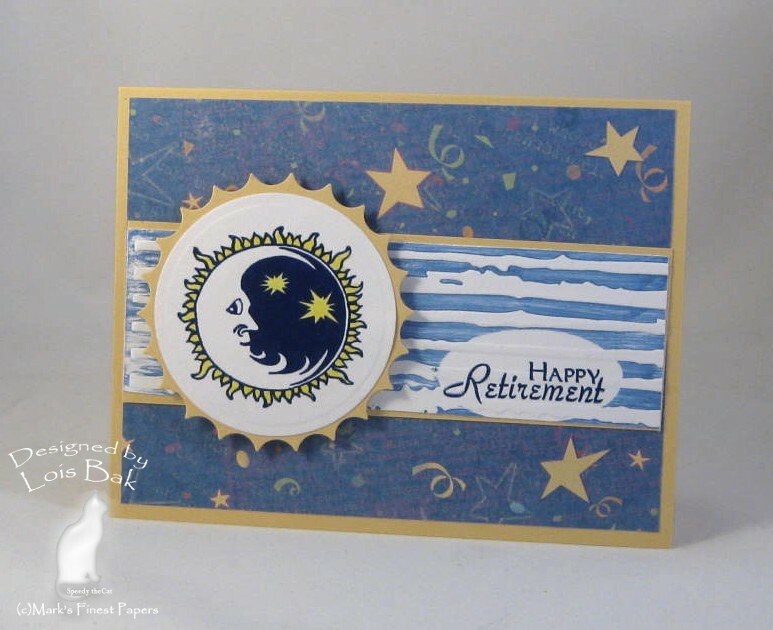 My brother-in-law has put in his papers to retire next year, so I made this card for him. It’s pretty self-explanatory – the moon/stars image is stamped with Versafine Majestic Blue and then clear embossed. I colored in the stars with a yellow Copic marker so that they would match the stars in the DP. Using the same layout for my second card, I stamped the sun onto MFP Lemon Yellow, cut it out, and glued it down onto a circle of MFP Breezy Blue. 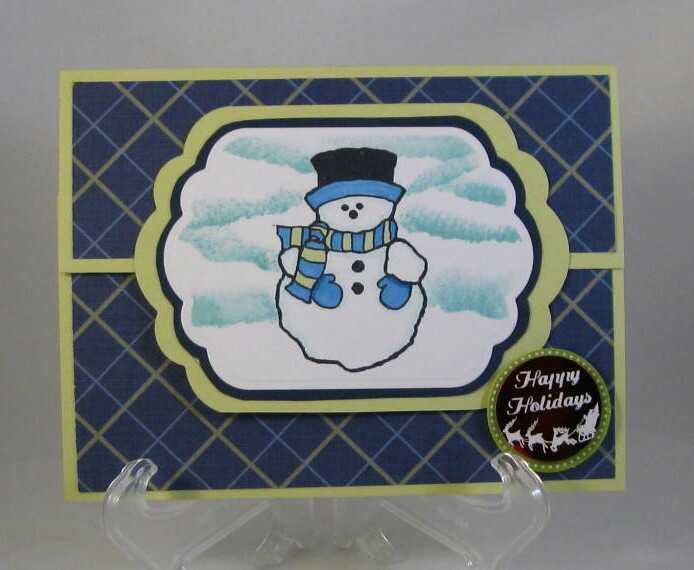 The DCWV patterned paper had all the same colors and provided a nice background. 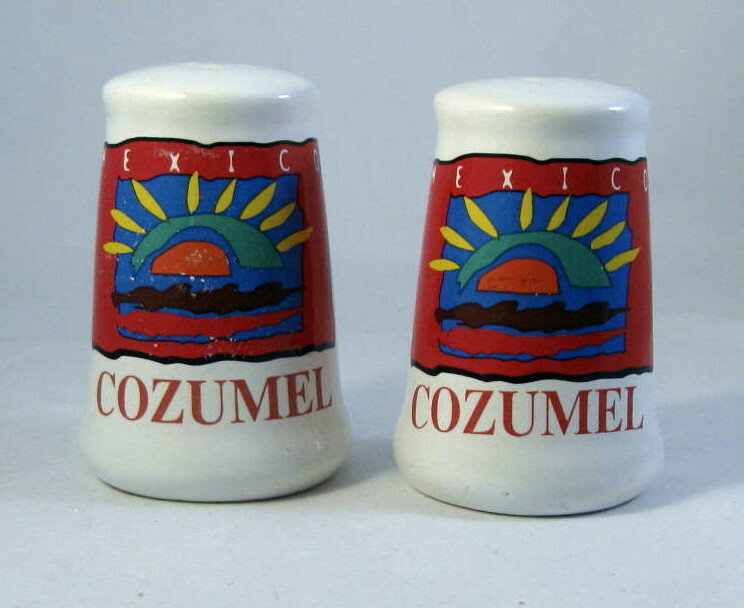 This set of salt & pepper shakers actually DOES coordinate with today's set -- see the sun on them! Don’t forget -- For another chance to win a free stamp set, be sure to visit the blogs of the rest of today’s design team and comment on each. Here is the Blog Hop LINE UP for today, but LOOK for a NEW LINK LIST TOMORROW!!! 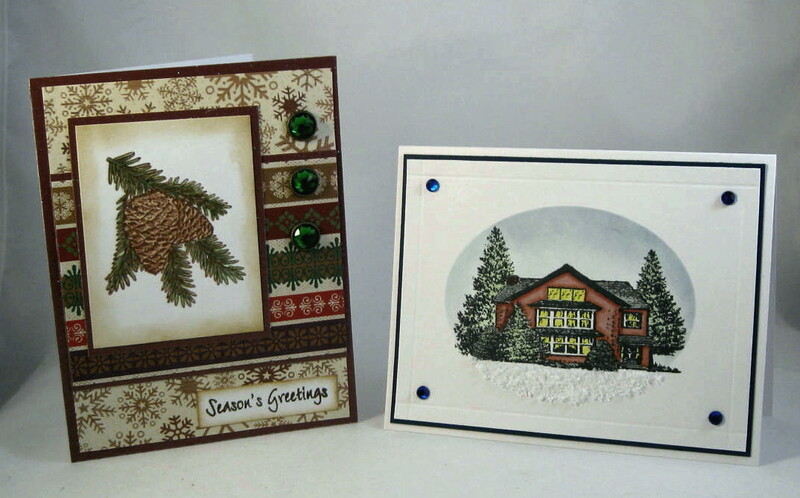 Again I have created two projects with today’s set – Nature’s Postage. My first card is a collage, using all three of the postage stamp images, which I placed on the DP from 7Gypsies Avagnon pad, which was torn and distressed around the edges. I added two copper diecuts from Spellbinders Timeless Heritage Shapeabilities set, along with the oval sentiment panel. My second card uses only one of the postage stamp images, stamped to look like a sheet – with one stamp ripped off. 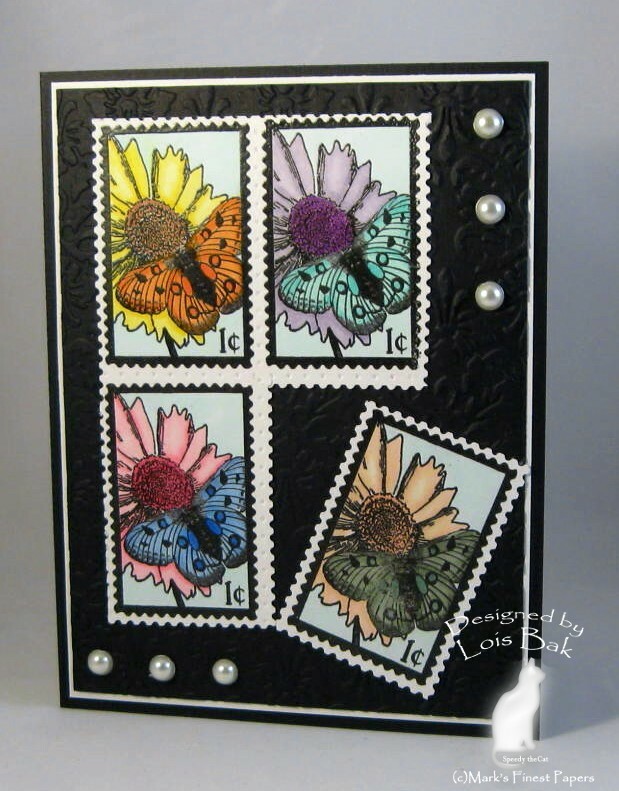 The black background was embossed with the Cuttlebug Kassie’s Brocade folder. 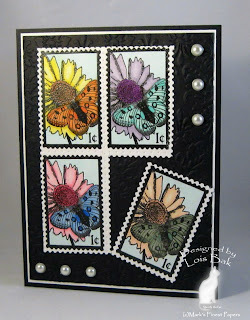 To create a "perforated" line between the stamps, I used the Scor-Bug Embosser. I love this funky little bee/flower set. A woman I work with gave it to me for my birthday. Be sure to visit the rest of the team to see what they did with this beautiful set and comment on each blog. You have a chance to win one of the stamp sets to be released next month. I’m starting off the Hop with two projects for today’s set – Hearts, Hearts, Hearts. This set has several small images, and I thought they would make cute tic tac toe pieces. 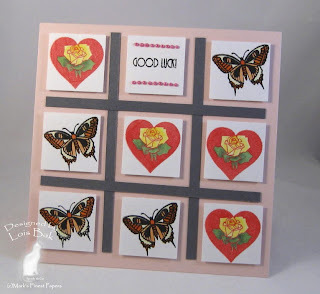 I stamped the smallest heart and the butterfly four times, colored them with Copic markers, and punched them out with a 1 ¼” punch. After putting in the grid lines, I placed the tic tac toe pieces in such a way that the hearts won. I added the Good Luck sentiment at the top – you always need luck in this game! My second project is a wooden box with a matching card. First, I stamped the heart wreath on MFP Naturals Ivory cardstock. colored it with Copic markers and then cut it out. 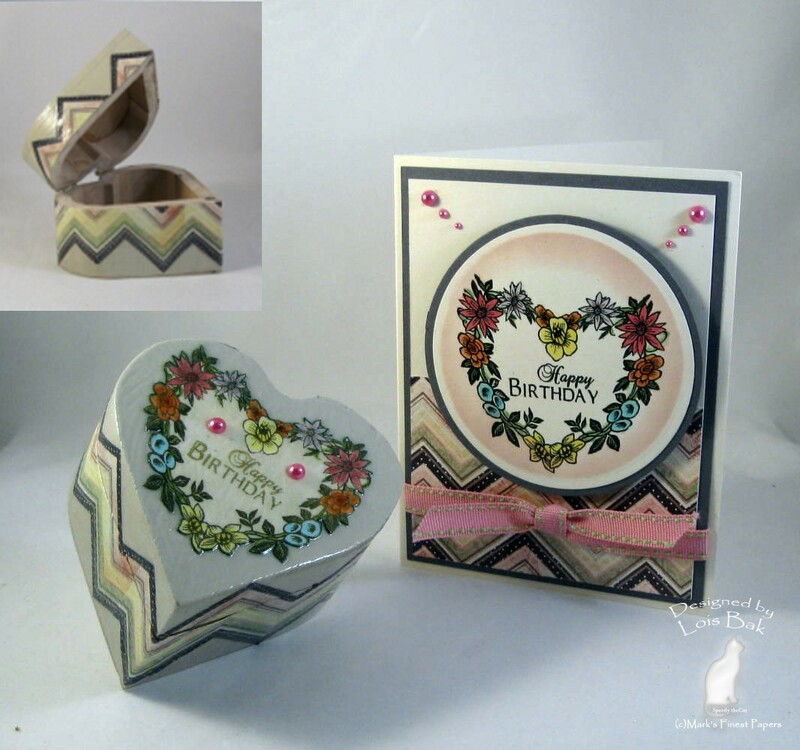 Using the zig zag DP from Basic Grey’s Porcelain paper pad, I glued it to the side of the box. Then I Modge Podged the box about three times. 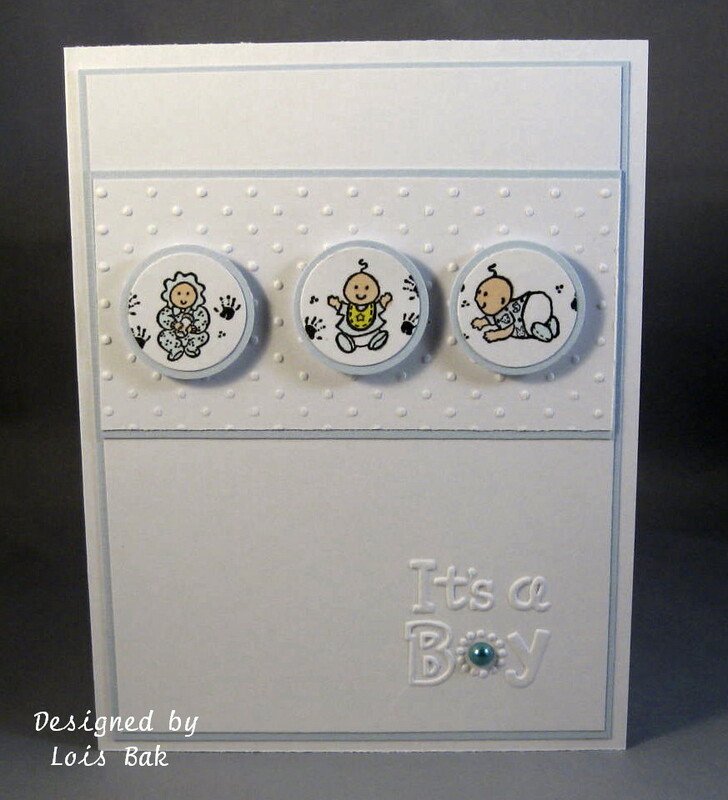 The matching card was made using the same stamp and DP. 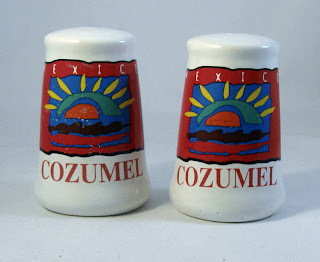 I have run out of salt & pepper shakers that coordinate with stamp sets, so I'm just going to show you some of my other sets this month. My sister and I had seen Wicked last year in Fort Myers, Florida. She told me when she saw this set that she had to buy it for me. Just coincidentally, The Wizard of Oz was on TV a couple of weeks ago! Be sure to visit the rest of the team to see what they did with this set. And remember, you have a chance to win one of the stamp sets to be released next month. 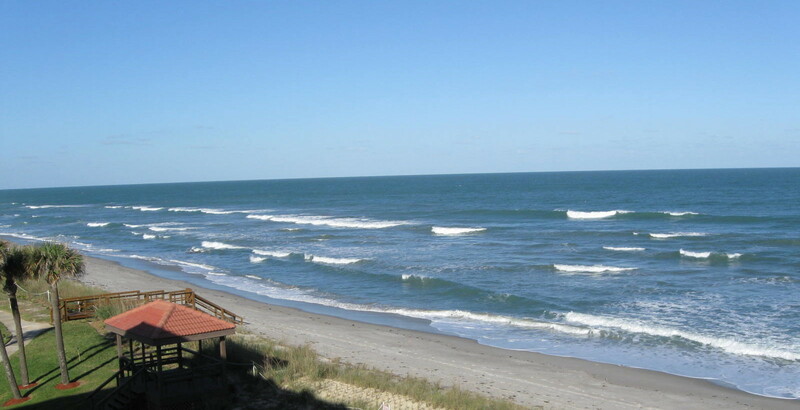 Every year my stamping buddy Rosemary and I take off for a week right after Thanksgiving and stay at her daughter's condo in Satellite Beach, FL. 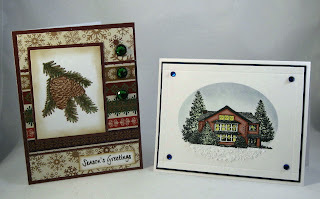 It's a week of relaxation and Christmas card stamping. This was our fourth trip. Here is the view from the lanai of our fourth-floor condo. I made a total of 34 cards -- 33 Christmas cards and one Hanukkah card -- all different. Here are a few of them. Of course, we made the rounds of Michaels, Joann, and Hobby Lobby. And one night we even made it to the movies and saw a great film -- Unstoppable, with Danzel Washington. What an exciting movie, which I understand was based on a true story. Now I just have to unpack all my stuff -- you can imagine all the stamps and supplies we had to take with us. I did conserve some space by taking only unmounted stamps; but there still was lots of ink, paper, embellishments and tools we had to take. She has a Toyota FJ Cruiser, and there wasn't a spot of empty space in the whole truck! 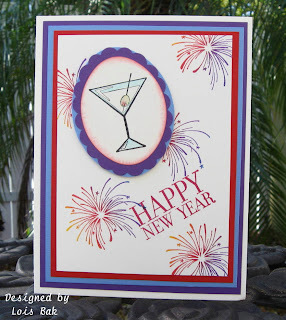 Emily gave the Stampin'B's quite a challenge this week -- make a card using purple and turquoise, but also include something shiny or sparkly. So I tackled this challenge head-on. The card base is purple and the nutcracker's jacket is turquoise. 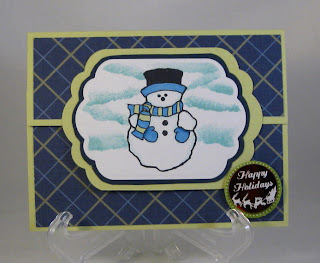 I love this nutcracker from one of Mark's Finest Papers' Christmas sets -- Christmas Postage Due. After coloring him with Copic markers, I added some Flower Soft to his hair and beard. And I don't know if you can see the detail of the brads or not. They have purple gemstones on them. (That was my shiny/sparkly item.) The DP is Basic Grey Marrakech.